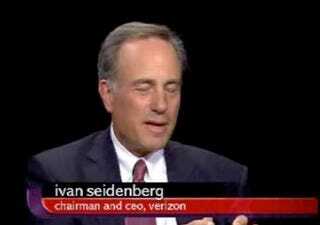 Ivan Seidenberg, Chairman and CEO of Verizon, just lays this captain obvious quote on Charlie Rose on the possibility of a Verizon iPhone. Reeeeeeeaaaaaaallly? You don't say. Apple's decision to make a phone that would work on a different technology than their current phone is...Apple's? Amazing! What's also interesting is their talk slightly later in the interview, of an "exclusive" Android device on Verizon. Charlie Rose asks Ivan about a possible exclusive Android device (he compares it to the Pre on Sprint and the iPhone on AT&T). Ivan then dodges the question with the standard not commenting on future deals move, but does it in such a way that it's a wink-wink acknowledgement that yeah, Verizon really is working on something with Android.